The perfect gift for special clients that you are looking to impress. This gift tower includes an assortment all of our finest candies The bottom layer is a 3 lb. milk and dark deluxe assortment. The second layer is a 16 piece bite-size truffle box . The third layer is 1 lb. of our milk and dark chocolate pretzels. The fourth layer is 1 lb. of our milk and dark chocolate nonpareils. The top is a 6 oz. box of our almond butter crunch. 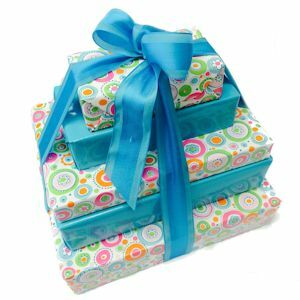 It is wrapped and tied as shown in the picture to present an elegant and tasteful gift. Almond Butter Crunch Ingredients: Milk Chocolate [Sugar, Milk, Cocoa Butter, Chocolate Liquor, Soy Lecithin (an emulsifier) and Vanillin (artificial flavor)], Sugar, Almonds, Butter (Pasteurized Cream, Salt and Natural Flavoring), Corn Syrup, Salt, Sodium Bicarbonate, Soy Lecithin and Tenox BCH. Milk Nonpareil Ingredients: Milk Chocolate [Sugar, Milk, Cocoa Butter, Chocolate Liquor, Soy Lecithin (an emulsifier) and Vanillin - an artificial flavor] and Nonpareil Seeds (Sugar, Corn Starch and Carnauba Wax). Dark Nonpareil Ingredients: Dark Chocolate [Sugar, Chocolate Liquor (processed with alkali), Cocoa Butter, Milk Fat, Soy Lecithin (an emulsifier), Vanillin and Natural Flavors] and Nonpareil Seeds (Sugar, Corn Starch and Carnauba Wax). Milk Pretzel Ingredients: Milk Chocolate [Sugar, Milk, Cocoa Butter, Chocolate Liquor, Soy Lecithin (an emulsifier) and Vanillin (artificial flavor)], and Pretzels (Wheat Flour, Salt, Corn Oil, Malt Syrup, Sugar, Yeast and Soda). Dark Pretzel Ingredients: Dark Chocolate [Sugar, Chocolate Liquor (processed with alkali), Cocoa Butter, Milk Fat, Soy Lecithin (an emulsifier), Vanillin (artificial flavor) and Natural Flavors] and Pretzels (Wheat Flour, Salt, Corn Oil, Malt Syrup, Sugar, Yeast and Soda). 3 lb. Assortment: Sugar, Whole & Non-Fat Milk, Cocoa Butter, Corn Syrup, Chocolate Liquor processed with alkali, Invert Sugar Syrup, Fondant Sugar, Coconut, Cashews, Pecans, Almonds, Cherries, Brazil Nuts, Peanuts, Raisins, Butter, Molasses, Raspberry Puree, Orange Pulp, Applesauce, Palm Kernel Oil, Salt, Dry Egg White, Cocoa, Soy Lecithin (an emulsifier), Canola Oil, Water, Vanillin (artificial Flavor), Glycerin, Invertase, Alcohol, Partially Defatted Peanut Flour, Non-Fat Dry Milk Solids, Peanut Oil, Locust Bean Gum, Xanthan Gum, Citric Acid, Propylene Glycol, High Fructose Corn Syrup, Dextrose, Bitter Almond Oil (Synthetic), Agar Agar, Pectin, Peppermint Oil, Natural & Artificial Flavors, Sodium Citrate, Confectioner's Glaze, Caramel Color, Sodium Carboxymethlycellulose, Dipotassium Phosphate, Carrageenan, Vitamin D3, Potassium Sorbate & Sodium Benzoate (preservative), Artificial Colors (FD&C Red 3 & 40, Yellow 5 & 6, Blue 1), Modified Food Starch, Sulphur Dioxide & Sodium Metabisulphite (preservatives) and Sodium Lauryl Sulfate (whipping aid). Contains Milk, Peanuts, Tree Nuts and Soy. Real Cherries May Contain Pits.